Make your culinary experience enjoyable with this Kutchina hob. This model captures the best of both worlds, functionality and style. Equipped with 3-heavy duty brass burners, you can speed up your cooking time using this model. 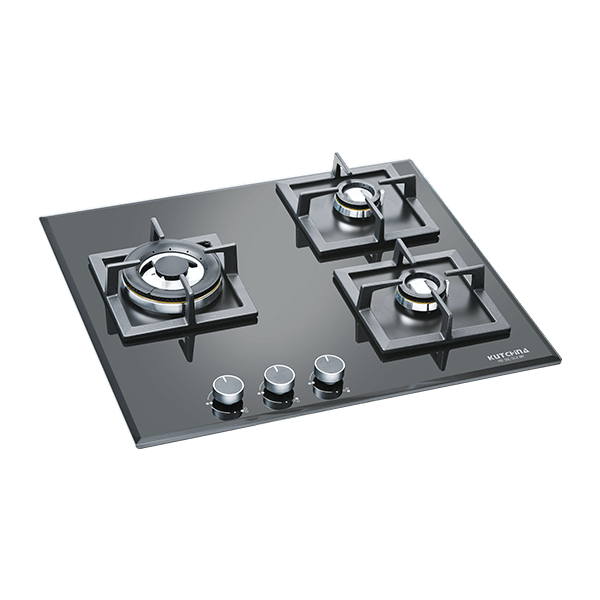 There are 3 dedicated metallic control knobs for each burner. Use the control knobs to adjust the flame and set the right cooking temperature to achieve the perfect taste in your dishes. The pan supports are made from cast iron and they last for a longer period of time. The high-quality glass cooktop finish gives this model a premium look and feel. Exposure to cooking fume is not just bad for your health, it also makes your kitchen cabinets look greasy and dirty. Steer clear of this issue with Arc chimney. Equipped with a high-power electric motor, this model has a high suction capacity and draws all the cooking fumes out from your kitchen. Kutchina Arc chimney is not just high in functionality but also in style. The sleek body lines and sophisticated colour combinations give this model a modern look. The stylish chimney will seamlessly blend into any kitchen decor. Keeping your kitchen smoke-free and looking pristine get easier with Amoro chimney. The model has a high suction capacity and keeps your kitchen free from cooking fumes which otherwise can form grimes, making your kitchen cabinets look dirty. This model comes with different speed controls; you can adjust the speed as per your cooking routine. Amora chimney also includes the 2nd generation auto clean technology which eliminates the hassle of having to manually and frequently clean the appliance. The premium, glossy finish of this model is sure to elevate the overall aesthetics of your kitchen.